Located along an original Inca Trail, 15 minutes from the main Urban and Agricultural Sectors of Machu Picchu, the Inca Bridge is an original wooden drawbridge that was be raised or lowed to control access to the citadel. The bridge itself is a simple wooden platform that is supported at each end by two high stone walls. The crudely constructed walls back up against the sheer cliff face of the western side of Machu Picchu Mountain, with the other side of the wall (and bridge) un-protected by the shear drop of approximately 300 meters (984 feet) to the bottom of the valley. The Inca Draw Bridge formed a protective entrance to Machu Picchu from the incoming Inca Trail that originates at Vilcabamba / Choquequirao. Compared to other impressive attractions at Machu Picchu, the Inca Draw Bridge can be somewhat underwhelming. However, the view of the rugged Andean mountains to the rear of Machu Picchu and the photographic opportunities of Machu Picchu itself make visiting the Inca Draw Bridge well worth the effort. It is worth noting that visitors to the Inca Draw Bridge can only admire the bridge from a nearby view point, and not actually walk on or cross the bridge itself. The trek is suitable for all ages and fitness levels. The trek follows an Inca Trail where you can observe an original Inca draw bridge used to protect the western entrance to Machu Picchu. The trail head is located within the grounds of Machu Picchu close to the view point of the Caretakers Hut. 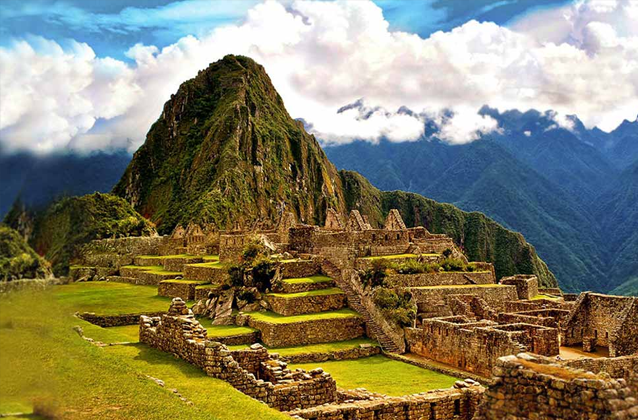 Panoramic photographic opportunities of Machu Picchu are excellent close to the trail head. From the main entrance at Machu Picchu follow the upper circuit around Machu Picchu ascending to the top of the Agricultural Sector. Continue on past the Caretakers Hut view point following a trail that is fairly well-marked with wooden signs. The trail head is marked by a warden’s hut where you need to sign in with a passport number before you trek. The hike from entrance of Machu Picchu to the trail head is fairly taxing and takes between 20 – 30 minutes to complete. From the warden’s hut, other than a few minor undulations the Inca Bridge Trek is fairly flat. Made up of dirt trails and a few Inca stone steps, the trail is easy to navigate and not difficult underfoot. Views from the trail take in the surrounding mountains and the modern hydroelectric plant to the rear of Machu Picchu. In places there are shear drop-offs of several hundred meters, so extra caution should be taken when on the trek. After about 15 minutes of hiking you will arrive at the Inca draw bridge. The bridge is in poor condition and trekkers are not allowed to cross, just simply appreciate the bridge from a nearby view point. Time needed: 40 minutes (total time). Terrain: Dirt track and Inca stone pathways. Recommended footwear: Training shoes, light weight walking boots. Entrance time: Can enter anytime during the regular opening times of Machu Picchu. Trail head: Located behind the Caretakers Hut in the Agricultural Sector of Machu Picchu. Tickets: Ticket not required, free to enter (at the moment). The Inca Bridge Trek is accessible all year round. During the wet season (November – April) there is a higher chance of heavy rainfall. The region has a subtropical feel throughout the year with average daily temperatures of 18 °C (64 °F). During the dry season the humidity is around 40 – 45%, rising to 60 – 65% during the wet season. Early morning trekking offers cooler temperatures and better shade from the sun. The weather in this region of Peru can often be unpredictable any time of the year, so you must be prepared with clothing for rain and sun. The trail is dirt track with a few stone steps so comfortable lightweight training or hiking shoes are recommended. A light weight rain coat or poncho and sun protection is advised. It is recommended to take one small bottle of water on the trek. The Inca Bridge Trek has some shear drop-offs, extreme care should be taken at all times especially if trekking with young children.